A multiplex real-time PCR reaction is carried out under optimized conditions in a single tube generating amplicons for HSV-1, HSV-2, VZV, and the Process Control (PRC). Identification of HSV-1, HSV-2, VZV, and the PRC occurs by the use of target-specific primers and fluorescent-labeled probes that hybridize to conserved regions in the genomes of HSV-1, HSV-2, VZV and the PRC. The Lyra Direct HSV 1+2/VZV Assay has one-step reagent set-up and a three-step sample prep. Test results are available in less than 70 minutes. 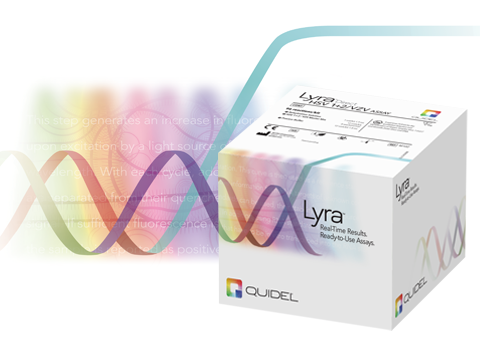 The Lyra Direct HSV 1+2/VZV Assay is available for use on Applied Biosystems® 7500 Fast Dx, QuantStudio™ Dx Real-Time PCR Instrument, and Cepheid® SmartCycler® II. The Lyra Direct HSV 1+2/VZV Assay is one in a growing menu of PCR tests and is used as an aid in the differential diagnosis of Herpes simplex virus 1 and 2 (HSV-1 and HSV-2) and Varicella-zoster virus (VZV) also known as Human herpes virus 3. VZV is the causative agent for chicken pox and shingles.